(CNS): Jugalkishore is a six-year-old boy whose impish smile hides the ugly germs of TB that are ravaging his health. He is the third child of Ramdulari — the charming, but uneducated, hapless wife of daily wage earner Shivprasad, who uses excessive alcohol and tobacco, and is also a former TB patient who successfully completed TB treatment. Jugalkishore, has recently been diagnosed with pulmonary TB and put on a 6 months course of free anti-tuberculosis treatment (ATT) since the last one month, at a DOTS centre. He is just one of the estimated one million children under 14 years of age who will need treatment for tuberculosis this year (approx. 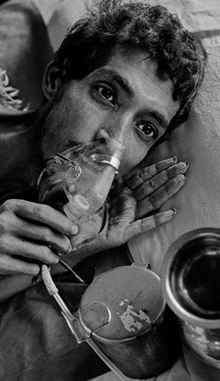 10–15% of 9 million cases estimated by the WHO Global TB Control Report 2011). Some experts believe that childhood TB is widely under-reported and can represent as much as 40% of the TB caseload in some TB high burden settings. Childhood TB ranks high on the public health priority list because TB is an important cause of child (and maternal) morbidity and mortality, and also because TB infected children are at greater risk than adults for developing active TB disease, as well as of having the TB disseminate throughout the body, including to the brain, where it causes meningitis. This type of TB is often fatal or leaves the child with major disability. But the likes of Ramdulari are ignorant about the seriousness of the disease. She only knows that he son had started coughing when he was two years old, which worsened over a period of time. The cough would be particularly bad at night, and often make him breathless. The parents would take him to a government hospital for treatment, but the medicines did not improve his condition. The doctors would ask them to buy medicines from outside, which they could not afford. He was eventually diagnosed with TB in the summer of 2011 on the basis of an X Ray. The doctor prescribed medicines most of which were to be bought from the private market. As they could not afford that, treatment was discontinued. After sometime, he was very sick again, so he was admitted in the hospital for 10 days. Another X-Ray was taken, and he was also given the BCG vaccine for a third time. Only when the doctors were repeatedly told that they were too poor to buy medicines, did they prescribe free medicines from the DOTS centre. The family has no knowledge about TB, or how it is spread. They did not even know that one gets free medicine for TB. They were not counselled about any infection control measures at the DOTS centre. The doctors did not tell them anything about cough hygiene, or about cleanliness, or how to protect others from infection. (When I met the child, he had had a severe bout of cough, and he was coughing very close to his 3 year old sister). No other family member has been asked by the doctors to get tested for TB, although the child’s father has been on ATT a few years ago and is coughing again. The child sleeps with the mother on the same bed along with his siblings. The family of Ramdulari lives in a typical urban semi slum area (in as much as the houses are not makeshift but permanent brick structures) of Lucknow, the capital of Uttar Pradesh, which boasts of the state of art medical facilities. They reside in a brick walled house in a very narrow by lane, carefully protected from the prying rays of the sun. There is a small open verandah, leading to two dark, dingy and damp rooms, with no access to sunlight, and hardly any ventilation. One of the rooms doubles up as a kitchen, which has a mud stove run on wood fuel. The smoke from the chulha, and from the bidis smoked in the house, linger in the closed environment for long. Ramdulari has 4 children, but she never had any institutional delivery. Like her other kids, Jugal Kishore too was born at home. He was an underweight infant and could be only partially breast fed due to the poor health of his mother. There is never enough to eat in the house, let alone milk or any other nutritive food for the children. Ramdulari has to manage a family of seven on the meagre earnings of around Rs 100 to Rs 150 ($2 or 3) per day, a major part of which is spent on the liquor and bidis of his husband, who has been coughing a lot of late. But he has not gone to the doctor, as he feels he has already completed the treatment of TB once, so he will not have it again. The case of Jugalkishore is not an isolated one. There are innumerable tales of neglect and apathy, which dampen the success stories of the government programmes. But if this is the situation in a metro city, one can well imagine what the situation would be in rural and remote areas. It may sound politically correct to cry hoarse in unison that we want a TB Free World by 2015, but merely chanting slogans are not going to make any difference in the lives of people like Ramdulari and her kids. One has to see what can be improved in the existing setup. Only if there was prompt diagnosis of TB and better contact tracing; only if the much publicised maternal and child health programmes of the government could reach these unreached populations; only if women could be made aware and counselled about family planning, exclusive breast feeding and basic health/hygiene measures; only if the healthcare services were more receptive to the needs of the poor people. The list may seem endless, yet it is achievable without any extra resources. A little more competency and accountability in our work, instead of a 'couldn't care less attitude', will go a long way in controlling childhood TB.